This sanskar/ tradition/ ceremony is performed on or after sixth or seventh month as per the gender of the child, sixth or even months for the boy child and odd months for the girl child. This ritualistic ceremony initiates the introduction of solid food for the baby. When the baby gets solid food for the first time, Mantras are recited and pujas are offered to the various deities. It is believed that, with Annaprasana, the flaws that arise due to intake of impure food when as a foetus are removed. It is also believed that Annaprasana ceremony will help to propitiate speech. The meaning of Annaprasana is anna=rice and prasana= to enter. Annaprasana is done after the Namakaran ceremony. 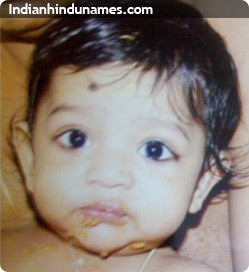 The baby is given rice kheer or payasam fed with a golden ring in some temple or in the presence of a priest. From here on you can continue giving the baby solid items in small quantity. According to the Grihyasutras, Annaprasana should be performed when the child is between six and seven months old. For a weak child, it can be postponed further. However it should not be performed before the child is four months old because he will not be able to digest food before then. Nor should the ceremony be performed after he is a year old because delaying additional nourishment could retard the child's natural growth and development. Some people believe that Annaprasana should be performed after the child's first teeth come out as this is a sure sign that he will be able to digest solid food. At the close of the function, different articles (books, fruits, toys, money etc.) are spread before the child. The baby is allowed to touch these items and it is believed that what the baby touches first will be his interest for the rest of his life. Visit this page to know about Annaprasana, choroonu ceremony in Guruvayur.